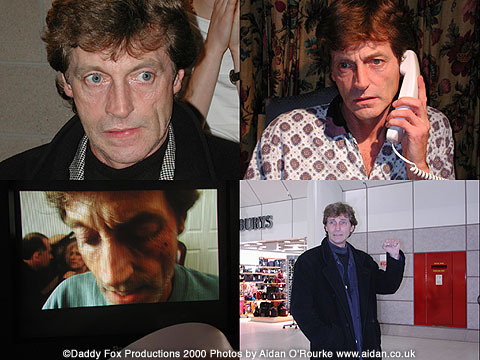 IN JANUARY 2001 Daddy Fox is being edited by director John McCormack and assistant director Martin Riley. In early January I was given a preview. I was impressed by the visual impact the opening scenes, enhanced by music, the intriguing nature of some of the images, but most of all by the power of the actors' performances. Daddy Fox has all the ingredients of a very successful film, but it remains for cinema audiences to decide whether this is going to be the UK blockuster of 2001, or not. Daddy Fox is to be premiered at the Cannes Film festival May 2001, and put on general release in the autumn. TARA DANIELS plays the lead female role in the feature film Daddy Fox. Tara's stunning anglo-hispanic looks and pale complexion make her uniquely photogenic. Her broad, expressive face is like an empty canvas on which she plays out an extraordinary range of emotions. 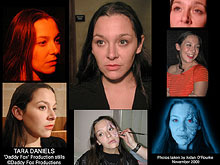 As part of her role in Daddy Fox, prosthetic make-up (designed and applied by Elaine Jones) covers one side of her face. We see the scarring only when she looks in the mirror - it reflects how the character Maggie sees herself. Tara Daniels has made many tv appearances, including Coronation St, A&E and Oh Dr Beeching and many more. She has extensive experience on the stage, including productions by her own company Zeitgeist. She was born in Marple of an English mother and Cuban father, grew up in Cheadle and now divides her time between Didsbury and London. STEPHEN PINDER is familiar to millions of British tv viewers as troubled Max Farnam in the Liverpool-based soap opera Brookside. 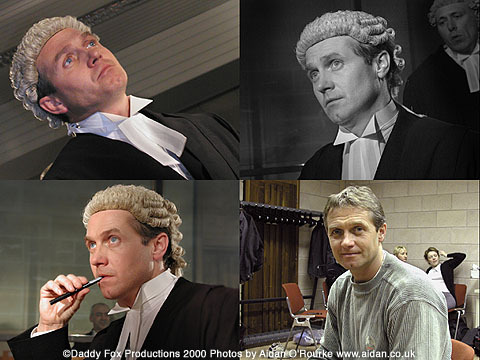 In the feature film Daddy Fox, he plays a prosecution lawyer and I have to say he turned in a masterful performance - I should know - I was crouching below him with my camera just out of shot taking the photographs above and left. Stephen has been acting since the 1970's and appeared in the Granada series Crown Court, not as a lawyer, as I initially thought, but as a child witness. ANITA DOBSON plays the wife of Nick's father Dodger. Anita is still well known to millions of UK soap fans as Angie Watts of EastEnders, even though she was only in the soap for three years (1985-88). From there she went on to enjoy a long and distinguished career in the theatre, television and film. The girl from Stepney who became an icon of Eighties Britain and symbolic of the spirit of London, has no prior connection with Manchester and this was her first visit. She tells me she found the people here very friendly and welcoming. Her charisma and professionalism were self evident, but she is also one of the most thoughtful and unpretentious people I have ever met. Shortly after filming ended, she celebrated her marriage to Queen guitarist and amateur astronomer Brian May. TOMMY BOYLE who plays the father of Nick, alias Martin Hancock is a veteran of the small screen, having appeared in Coronation Street, Hollyoaks, the Professionals, the New Avengers and many more. The man with the chiselled features who looks like a rock star is seen frequently in Didsbury - he grew up there and has many local connections. He tells me John McCormack offered him the part after approaching him in the street. I was highly impressed by Tommy Boyle's professionalism and his amazing ability to become the character as soon as the clapperboard fell, but he's also very modest, shuns publicity and treats acting as a job like any other. 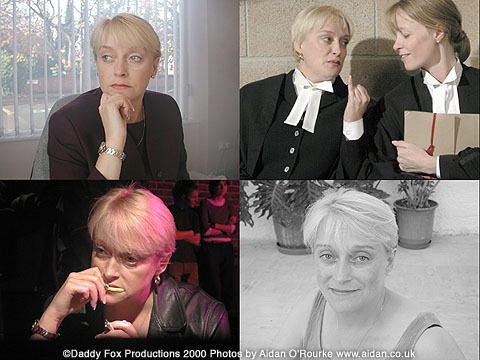 GILL JEPHCOTT plays a defence lawyer in the film Daddy Fox -a woman with some character failings, including chronic alchoholism, as portrayed in the picture lower left and a penchant for toy boys. The ex-teacher from Northenden gave what I thought was a fabulous performance in John McCormack's first film The Van Boys. She is excellent in this film too. In November 2000 she made an appearance in two episodes of Emmerdale, a drama she's eminently cut out for. With over 1000 requests for photos of her, it's evident soap fans think that too. A touring theatre role means she is unable to return to the Yorkshire-based soap opera for the time being.